SHOWING art in intimate settings is the raison d’etre of Art Apart Fair since it was started in 2013. This year, Singapore’s homegrown international art fair will see works from up to 100 artists from Europe and Asia, besides art collected by three private collectors in a new setting: Pan Pacific Orchard, just off Singapore’s iconic shopping district. The works of art will be placed throughout the hotel’s lobby lounge area, the third floor where the function rooms are as well as the penthouse and suites on the 20th floor. Works will be artfully placed in corridors as well as the rooms, to give visitors a sense of how they will look in a home setting. The seventh edition in early 2016 saw some 3,000 visitors over three days. This year’s fair will be extended to five days, to support Singapore Art Week. A stunning sculptural installation made from found objects will greet viewers when they step into the hotel lobby. Architect Fong Hoo Cheong explores disjunction and repurposing in his installation of “useful” objects – in this case, chairs. The ‘useful’ becomes ‘artful’ and the space forces one to questions one’s eyes. Fong is the founder of the boutique Architecture Firm, HCF and Associates and he has a fondness for installations that are the rudiments and elements of architecture. Headlining international artists’ works -- from the UK, Spain, Russia, Philippines, Indonesia and Korea -- will be Belgium’s Skullmapping, an artistic collective founded in 2010 by Filip Sterckx and Antoon Verbeeck. Filip is an award-winning filmmaker and visual artist, and Antoon is a fine arts painter who runs his own gallery. They create projection mapping projects, VR experiences and holograms. The Fair will show “The Petit Chef” which is a 3D projection on one table of four persons at the Fair. From Singapore, the feature artist is Ben Puah who studied at the Royal Melbourne Institute of Technology and LaSalle College of the Arts. The recipient for the President’s Young Talents in 2001 is interested in story-telling with darkly humorous themes. Straits Times journalist Ling Yang Chen will be showing his photographic collections in an art fair for the first time, on Chinese opera, nature and architecture. A special platform will be given to selected works by final year students of Nanyang Academy of Fine Arts, and Pan Pacific Orchard will sponsor artists from the Very Special Arts Singapore to show new work. Besides individual art works selected and curated by Art Apart Fair founder Rosalind Lim, this year’s exciting development will see art works and designer furniture put forward by three private collectors: Dr Stanley Quek, Lynette Wong and Ernesto Bedmar. The Fair represented its first private collection in the fifth edition, in 2015. Besides staking its spot in Singapore, Art Apart Fair has also taken its special proposition to hotels overseas, to London in 2014 and it plans to go to Sydney in 2017. “We’ve always featured international and Singapore artists in our fairs, and by being in London, Singapore and now Sydney, we have greater chances of connecting artists from Europe, Asia and the Pacific,” says Ms Lim. As a long-time patron of Art Apart Fair, Dr. Stanley Quek has long supported the fair by sponsoring artists and buying their works. The general practitioner-turned-property magnate been an avid collector of contemporary art since the mid-1970s. 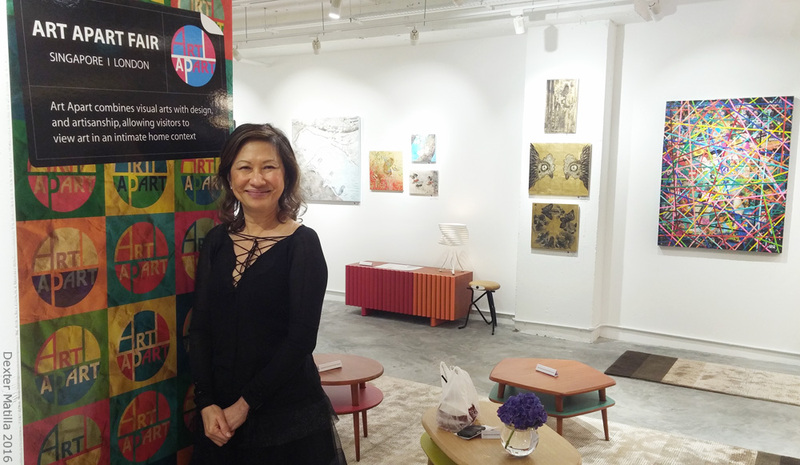 Lynette Wong was trained as a lawyer and started collecting furniture and art about 10 years back. The art was collected in mind for her black-and-white bungalow while the unique furniture pieces and lighting were picked up mainly from international auctions. They include creations by Hans J Wenger, Arne Vodder, Arne Jacobsen, Poul Henningsen, Illum Wikkelso. Ernesto Bedmar hails from Argentina and is the director of architectural company Bedmar & Shi. A dedicated art connoisseur, he has been collecting art for more than three decades and has a special interest in Southeast Asian art. Malaysian Artist Chong Siew Yin “L]etre Par Le Visage VI2002 “ from the private collection of Ernesto Bedmar. Annex II: Artists from Very Special Arts include Teresa Tan, Fern Wong, Zoe Tan, Eugene Soh and Raymond Lau. Erica Hestu Wahyuni graduated from the Indonesian Fine Art Institute in Yogyakarta and Surikov Institute of Art, Russia. Erica’s naive, playful renditions have ascertained her reputation as one of the most sought-after contemporary artists in South East Asia.